Annamalai Reforestation Society (ARS) is a non-profit volunteer organization that aims to preserve and regenerate Mount Arunachala in Tamil Nadu and its surrounding areas. The organization’s mission is to spread environmental awareness, its problems and solutions, and promote a harmonious balance between all living creatures through educational campaigns and programs. The Society also coordinates with other organizations on similar causes. ARS’s main benefactor is the Rainforest Information Center (RIC), based in Australia. Apeetha Arunagiri founded ARS in 1988, with the help and support of IRC. Their Australian sponsor also sends deputy personnel to assist with ARS operations. Today, John Button, an RIC director, helps manage the ARS Permaculture Farm Model as a consultant and conducts a Permaculture Design Course at Tiruvannamalai. - and women development projects. ARS’s main nursery provides saplings for reforestation activities on Arunachala Hill, as well as on Giri pradakshina road. The nursery also supplies to individuals, schools, NGO’s and other institutions. The farm, donated in 1992, consists of an eight-acre area in Tiruvannamalai where ARS implements renewable energy models (biogas, wind and solar power), water management and soil conservation practices. The area also hosts a poultry and sericulture farm, along with an education facility for seminars and workshops. 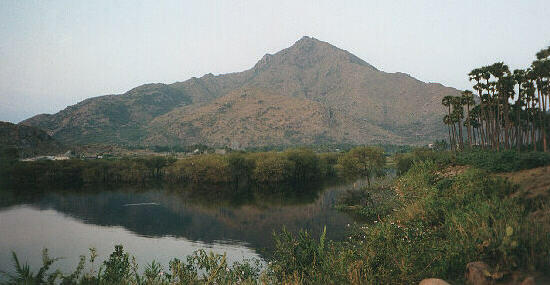 The Society not only seeks the total revitalization of Mount Arunachala, but its surrounding lands as well. Surrounding temple lands and wastelands are being replanted with fruit/herbal/ medicinal tree and flowering plants. ARS projects include the Arunachaleswarar Temple, Kannappar Temple, Yama Lingam land (a barren temple) and Niruthi Lingam. The Society also provides lectures, demos and other educational campaigns in schools. ARS encourages children to start their own Eco-Clubs to spread environmental awareness among their peers. The Sri Unnamulai Rural Women’s Development Society or REGD arm of the ARS focuses on women empowerment through various training programs. REGD offers practical skills training like nursery raising, food preservation, vocational courses, and organic farming among others. Volunteers and donations are always welcome. The Society needs you to continue its meaningful work with your generous contribution of funding and/or participation. This entry was posted on Saturday, May 22nd, 2010 at 4:09 pm	and is filed under India projects, Volunteer Opportunities. You can follow any responses to this entry through the RSS 2.0 feed. You can leave a response, or trackback from your own site.